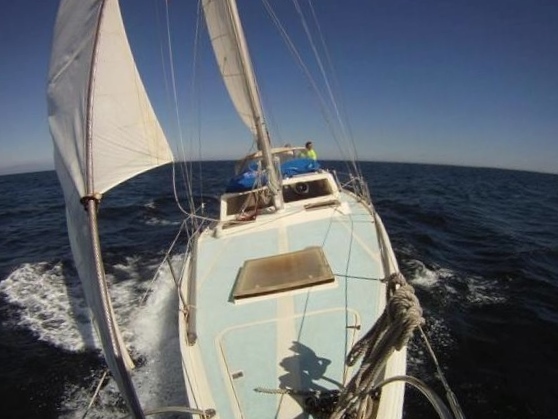 Columbia 45 – Which Sailboat? Bill Tripp Jr. designed the Columbia 45 to be a center-cockpit motor-sailer, but she’s more like a modern deck saloon before her time. 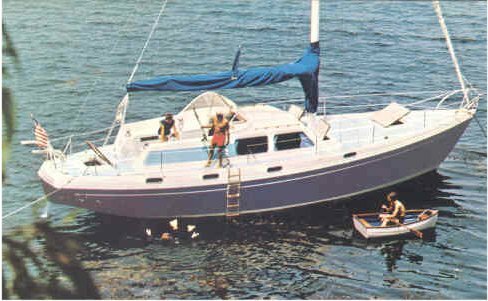 From 1971 to 1976, Columbia Yachts built a total of 180 Columbia 45s. Many have crossed oceans and they make great live-aboards for coastal cruising and island hopping. The Columbia 45 boasts voluminous space below with standing headroom throughout including two good staterooms and two heads (and many with dual showers), excellent storage, decent tankage, a sturdy hull and easy-to-manage rig, and powerful auxiliary power. However, the boat is often overlooked on first impression because of an ungainly deck house design and because of its motor-sailer classification. Many sailors immediately discount a motor-sailer as a boat that does neither well, but such a discount is not warranted for the Columbia 45. Her hull design is based on her smaller sister, the Columbia 43, which is well-regarded as a sailing boat that finished respectably in many races. The Columbia 45 benefits from being designed as a cruising boat, and not having a design manipulated to compete under any racing rule. She has no extremely pinched stern, no extreme overhangs, no aggressive initial tenderness, and no huge head sail necessary for power, and no mizzen sail peculiarities. She has moderate overhangs fore and aft, moderate beam, and a generally conservative yet modern hull form. Her sail plans are reasonable. Unfortunately the Columbia 45 suffers from an ungainly appearance by modern and traditional tastes due to the styling of her deckhouse and cockpit. The deckhouse is tall and square fiberglass with large portlights facing forward and on the sides. The sides of the deckhouse continue aft without portlights to form the cockpit seats and coamings, which simply looks odd, unbalanced, or an incomplete design. The portlights on earlier boats were aluminum rimmed with clear glass as was common in boats of this vintage, but later boats featured more attractive smoked glass, and later smoked plexi-glass portlights flush with the house. Some of the boats with the flush smoked-plexiglass lights had a wide horizontal stripe aft of the portlights intended to improve the look, but which mostly fail to do so. Fortunately, the ungainly and dated design of the deckhouse can be corrected with relative ease by a handy owner (more on that later). Some early Columbia boats had inferior build quality and suffered from hulls that would oil-can. The Columbia 45 came later, escaping hull-related build quality issues. The hull is solid hand-laid fiberglass. 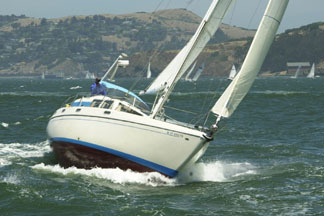 Hull and rigging are consistently reported to be “heavy” and “stout” by owners. The topsides give 5′ of freeboard which enable more room down below and fewer swamping waves in heavy weather. The Columbia 45 came from the factory with a deep fin keel drawing 7’3” or long shoal draft fin keel drawing 5’3”. The deep fin keel weighs approximately 10,300 lbs. Considering overall displacement at 25,000 lbs, the boat a very respectable ballast-to-displacement ratio of 41%. The long shoal draft fin weighs 2,000 lbs more, giving a ballast-to-displacement ratio of 46%, which keeps the boat stiff despite the higher location of the ballast. Both keels are cast iron, attached to the hull with galvanized steel bolts that are bolted through the fiberglass, a piece of plywood sandwich on the inside of the hull, and additional fiberglass. The plywood strengthens this high stress area, but is likely to have rot issues due to its location in the bilge. The rudder is skeg hung, which while not as responsive as an independent spade rudder, is safer for cruising. The rudder is relatively large and has plenty of grip on any point of sail. 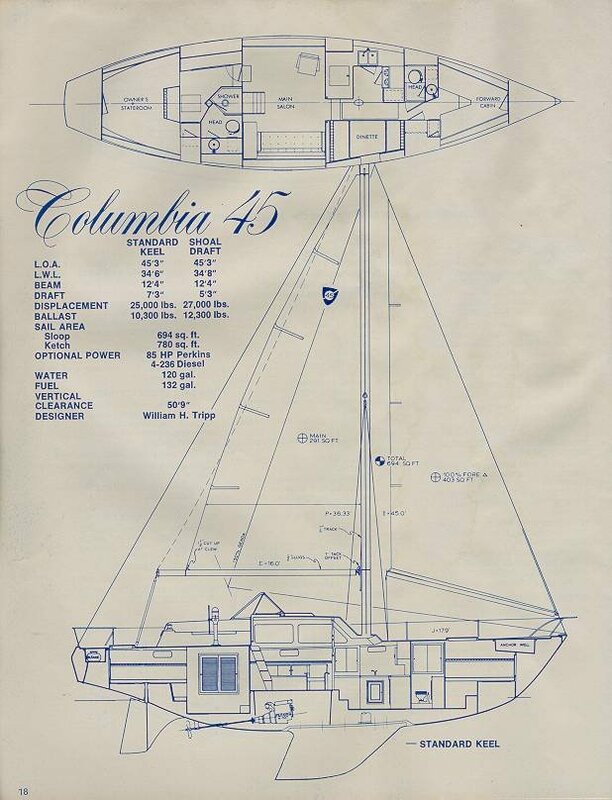 The Columbia 45 came with either a masthead sloop or masthead ketch rig. The ketch rig has approximately 10% more sail area than the sloop. Despite the larger sail area of the ketch, the performance of the two rigs is roughly the same due to inefficiencies associated with the mizzen on many points of sail. With either rig, the deep fin keel is the best performer. For sailors who prefer a sloop, the ketch can be converted to the sloop with relative ease (See Owner Improvements below.). The main mast (or only mast if the sloop configuration) is keel stepped. The mizzen mast (if the ketch) is stepped on the rudder skeg, which is an excellent structural design element. The working jib is self-tacking with its own car and track forward of the mast, making for easy fore-sail handling. Halyard winches are located on the masts. There are only two sheet winches, both located in the cockpit. Additional sheet winches could be installed (more on that later). While the Columbia 45 has sail area less than its more respected smaller sister, the 43, and the 45 is heavier than the 43, their sail-area to displacement ratios are comparable. A ketch-rigged fin keel Columbia 45 has a ratio of 14.6 while a sloop-rigged shoal draft Colombia 43 has 15.8. The 45 has much the same rigging as the 43, but carries less sail area than the 43 because the boom must be elevated above the 45’s raised deckhouse, which is also a common compromise on modern deck saloons. The Columbia 45 came from the factory with engines sized for a motor-sailer, but today they are closer to standard engines installed in many new sailboats. Columbia installed 4-cylinder Perkins diesel engines, either a 4-107 making 45 hp, a 4-108 making 50 hp, or a 4-2326 making 65 hp. Apparently, a few boats near the end of the production run had 6-cylinder Nissan engines, making 100 hp, installed when Perkins engines were in short supply. Unlike the potentially problematic v-drive of the Columbia 43, the 45 has a straight drive shaft with traditional stuffing box to a 20” 3-bladed prop, with either a 13 or 14 pitch. The shaft is slightly off center to starboard, which allows the shaft to be removed without interfering with the rudder skeg. This arrangement causes the boat to move to starboard in forward and reverse, but not so much as cannot be corrected with rudder adjustments. Although Columbia is not known for installing good marine systems on their boats, systems access on the Columbia 45 is excellent making repairs and upgrades relatively easy if they have not been made already. Access to the engine, batteries, and diesel, fresh water, and holding tanks is through large hatches in the raised saloon sole. A separate propane locker is situated in a lazarette in the aft deck of the boat. The electrical panel is a good location to the outboard of the companionway steps. Tankage is good for a cruising boat, but not outstanding, with 132 gallons for diesel in an aluminum tank (with a factory option for a second tank of equal volume) and 120 gallons for fresh water (with a factory option for a second tank of equal volume). Holding tankage appears to have varied. Unfortunately, the diesel tanks were glassed in place and are nearly impossible to remove without major cutting. The water tanks were part of the hull liner. Some owners have installed thank liners to repair leaking diesel and water tanks. 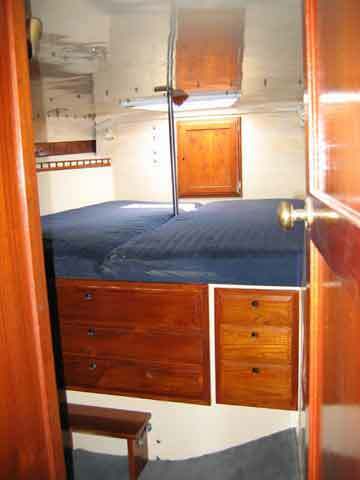 Like many modern deck saloons, the saloon area of the Columbia 45 at the foot of the companionway steps is raised, allowing views of the exterior through the large portlights in the deckhouse. Some boats also came with an interior helm station in this area, complete with wheel steering, engine controls, and instruments. This raised saloon area was often not fitted with any furniture from Columbia, allowing owners to install whatever furniture suited them. 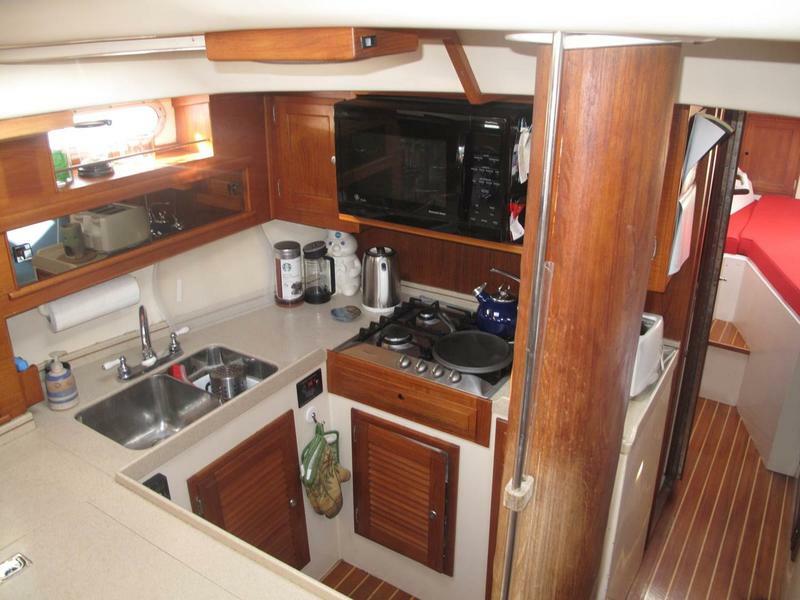 Forward of the raised saloon and two steps down to starboard is the dinette, which has ample storage cabinets outboard for dishes, cups, etc. There is small opening portlight above in the topsides and an opening hatch directly above for ventilation. By modern standards for a boat of this length, the dinette is woefully undersized, fitting only two adults comfortably. 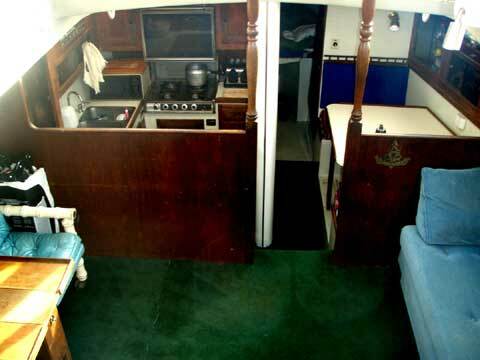 To port of the dinette is a wraparound galley, which is also open to the raised saloon. There was some variation in galley configurations over the years; and some boats have a bar setup between the galley and the raised saloon. 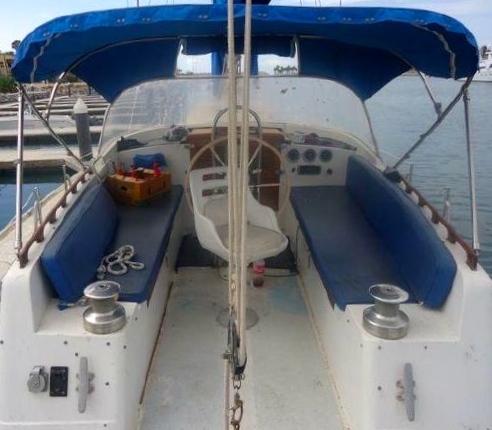 The galley is generally excellent with a wraparound counter, a gas range and oven forward, a large icebox aft, and a deep two basin sink outboard. The outboard location of the sink will cause drainage problems on a starboard tack for owners who refuse to heave-to during meals. An industrious owner could swap the locations of the icebox and sink. There is ample storage inboard of the range and oven, and below the counter. Above the sink is a small opening portlight, and an opening hatch above for ventilation. Forward of the dinette and galley to port is the forward head with shower. There is storage above the sink and below. The head has no opening hatch so that ventilation could be an issue, although some boats have dorade vents installed. To starboard is an absolutely huge hanging locker. Forward of the head is the forward stateroom with a v-berth. 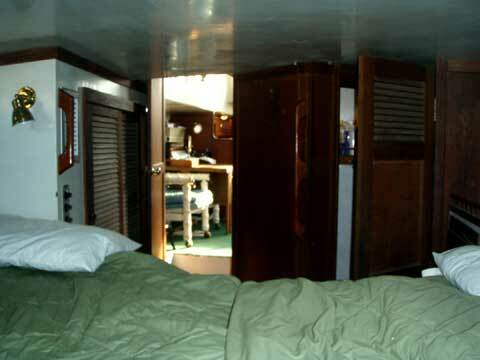 There are storage drawers to starboard at the entry, and small shelves along the inside of the hull above each bunk. There is a large opening hatch in this stateroom just above the entry for ventilation and emergency egress. Aft of the raised saloon to port are two steps down into the owner’s stateroom, which takes up nearly one third of the interior volume of the boat. There is standing headroom except above the berth, and plenty of floor space to move around. There is a small opening portlight for ventilation, which is covered if the room is fitted with the hanging locker. 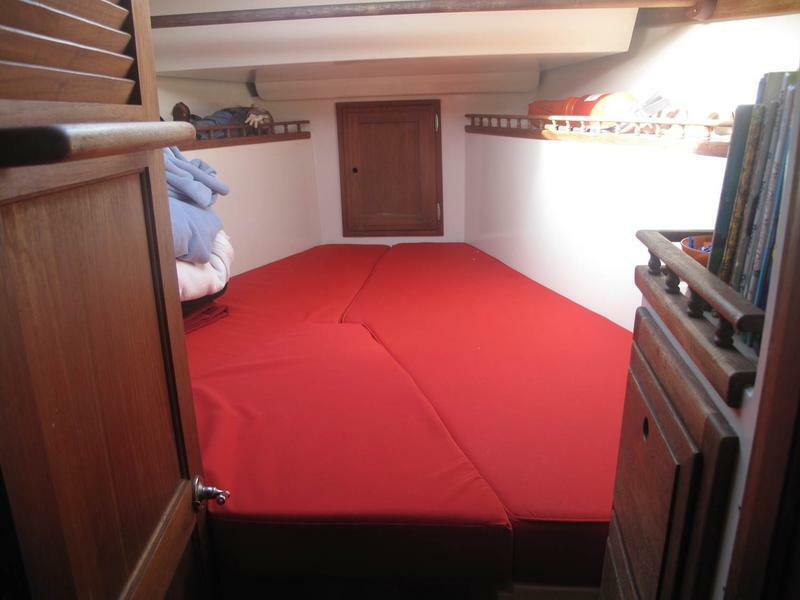 Upon entering, to port is a large hanging locker or a settee with storage above and behind, and to starboard is a large ensuite head with a separate shower stall. The head has storage above and beneath the vanity. There is a portlight in the topsides above the settee and a portlight in the topsides in this head. There is a small opening portlight in this head for ventilation. To starboard aft of the head and forward of the master berth is a good-sized hanging locker. The master berth is more than queen size, stretching from the port to starboard sides of the boat and all the way to the aft end of the stateroom. There is a center insert at the forward end of this berth like what is common in v-berths. Unfortunately on the ketch rig, this berth is interrupted by the mizzen mast. There are storage drawers beneath this berth, and small shelves along the sides of the hull above the berth. There is a storage locker at the aft end of the berth. There are small opening portlights on either side of the berth for ventilation and a large opening hatch for ventilation and emergency egress. Like a modern deck saloon, the cockpit is open to the rear deck at the aft end. A hard dodger was optional from the factory. The deck is essentially flush everywhere except for the raised deckhouse. The cockpit seats are long enough for lounging. Beneath each cockpit seat is a large locker. Unlike a modern deck saloon, the Columbia 45 came with single wheel steering installed in the center of the cockpit rather than twin helm stations as is popular now. Columbia installed a relatively small wheel, but it is still a little difficult to get around it. A larger folding wheel could be installed, which would update the boat and be easier to get around. The boat only has two sheet winches, which are located at the aft end of the cockpit coamings. Unfortunately, there is not enough space to add another set of winches on top of the cockpit coamings, but a set could bet added at the forward end of the cockpit on the aft top of the cabin house. Aft of the cockpit is a rear deck, which is flush with the cockpit sole so that cockpit draining will never be an issue (as long as the boat is not overloaded in the bow). The aft deck mostly taken up with the opening hatch for the master stateroom below, but still makes boarding easy when docked stern-to. Aft of that hatch is a lazarette. To move forward, one invariably exits the cockpit to the flush aft deck and moves around to the side decks, rather than climbing over the cockpit seat coamings and taking a steep step down to the side decks. On the ketch rig, the mainsheet can require a little negotiating when exiting the cockpit aft, but the location of the mizzenmast just aft of the mainsheet makes for a nicely placed handhold. The side decks are narrow but wide enough for one to move about comfortably. Due to the high deck house with handholds, moving forward to the mast feels very secure. Halyard winches are located on the mast. Forward of the mast, the deck is flat and uncluttered, with only one opening hatch to negotiate. There is a stout bow pulpit for working forward. The anchor locker is small for a boat of this size but there is a huge space for rode. The aluminum-framed portlights (if on an earlier boat) in the deckhouse can be replaced with smoked plexi-glass portlights, and then the sides of the deckhouse can be painted black to match the smoked portlights. Such a treatment creates a look similar to current boats from Nauticat Yachts, and also somewhat reminiscent of older boats in the Southerly line or Jeanneau Sun Odyssey DS (Deck Saloon) line, or perhaps an Oyster from a distance. At the time of manufacture, ketch rigs were more popular than today. Although ketch rigs offer advantages to the cruising sailor, such as sail area management without reefing and using the mizzen as a riding sail while at anchor, some owners have converted their ketch rigs to sloops for better windward performance and simpler sail handling. This has the additional benefit of removing the intrusive mizzen mast from the aft berth. 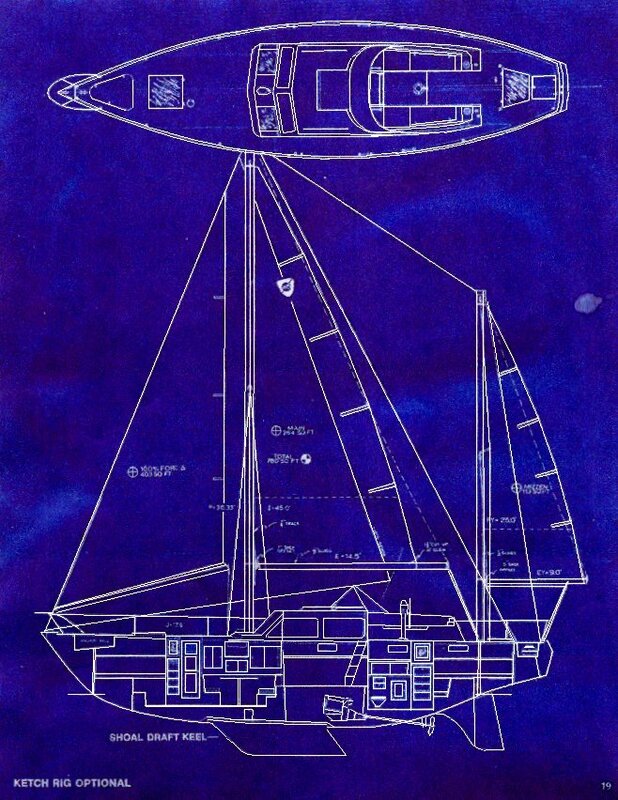 For the Columbia 45 ketch, the main mast was the same height as the mast of the sloop, but the boom was shortened by 1.5′. By removing the mizzen mast and replacing the boom on the main mast, the ketch can be converted to the sloop rig with relative ease. It’s worth noting that the interior arrangement of the Columbia 45 lends itself to great flexibility, allowing the configuration to fit a larger crew. The undersized dinette could be replaced by over and under bunks, and converted to a private cabin with a bulkhead and sliding door. The raised saloon could be made the primary dining area. The huge berth in the owner’s stateroom could be cut away on one side and a desk and chair installed. Ventilation is less than adequate if sailing near the equator, but the fixed portlights could be replaced with opening portlights, or opening hatches and dorade vents installed as many owners have already done. Columbia 45s are available on Yachtworld from $20,000 to $70,000, depending upon condition. For a boat of this vintage, condition varies widely. Prospective buyers should be particularly careful to inspect electrical systems and tankage, keel bolts, bolts at the bases of the mast(s), and the plywood sandwich above the keel, in addition to the items one would inspect in any boat of this vintage. Special thanks to Brandon Ford for his contributions to this article.